When I was in elementary school, we would pay for our lunch with things called "lunch tickets". A big white ticket would get our meal, usually something that changed every day or you could choose a cheese sandwich or a peanut butter and jelly sandwich, but that wasn't what I looked forward to. I packed my lunch most days because I hated the school menu. What I would hold on to were the small pink tickets. The "snack ticket". Near the end of lunch every day one of the lunch ladies would come around with a big tray full of Jack and Jill ice cream bars and every day I would get an orange creamsicle to round off my lunch. Ever since, orange creamsicle has been one of my favorite flavors. 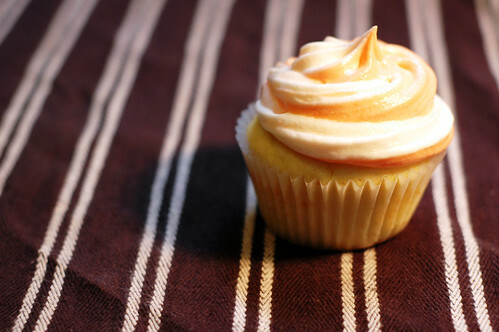 I took that flavor and turned it into a cupcake, a sweet orange cake with a creamy vanilla buttercream with an orange swirl in it. They taste great at room temperature but if you want an experience more like the ice cream, try eating it straight out of the fridge (be careful: if they are left in the fridge too long the cake will begin to dry out, these are best eaten the day of baking). Preheat oven to 350°F and line a 12-hole muffin tin with paper liners. Cream the butter and sugar together in a large bowl until fluffy. Add in the eggs one at a time, beat well after each addition. Add in the vanilla extract and orange zest. Set your mixer to a low speed and add the flour and milk in three additions, flour - milk - flour - milk - flour. Mix each until just incorporated. Scoop into prepared muffin tin and fill each hole evenly. Bake for 18-20 minutes or until a toothpick inserted comes out clean. Place them on a wire rack to cool COMPLETELY before frosting. Cream butter until smooth. Add in 2 cups confectioners' sugar and then the milk and extract(s). Mix together about 3 minutes, until smooth and creamy. Slowly add the remaining sugar (1/2 cup at a time) and beat well after each addition. You may need less sugar, you may need more. Add until you reach the desired consistency. Separate half of the frosting into another bowl. Add red and yellow food coloring to one bowl until desired shade of orange (add a couple drops at a time, it is easier to darken than it is to lighten). Prepare a piping bag with your tip and with small spoonfuls, add white frosting to one side of the bag, then orange frosting, and alternate until your bag is full. Pipe onto cooled cupcakes.